Indian- Americans account for just about 1 percent of the total American population but when it comes to their contribution, they have pole-vaulted to an excessively prominent position in American medicine, academia, corporate and particularly the high-tech domain. The reason for this can be attributed to the number of highly qualified Indian-Americans who hail from the most renowned engineering institute in India, Indian Institute of Technology. The rise of Indian American community in technology driven businesses in the US has played a vital role in the overall growth of the economy. Notably there are 3.2 million Indian Americans in the US out of which 72% graduated with a bachelor’s degree or higher. Researches have unveiled that Indian- Americans start more companies than any other immigrant group. In New Jersey stats were reported to be 57%, followed by 28% in Massachusetts and 26 % in California. In addition to that, New York was accounted to hold 27% along with Florida and Texas each accounting to 17%. Indian “tech pioneers” such as Vinod Dham, who mastered in manufacturing breakthrough technologies such as the Pentium chip and entrepreneurs like Kanwal Rekhi and Vinod Khosla, who founded Excelan and Sun Microsystems, have created foot prints for others to follow on their tread mill. Significantly, 9 companies on the fortune 500 list have Indian- American CEOs whereas 66% Indian- Americans are employed in professional/ managerial specialties. Besides that, the most astounding news revealed was that 33% of all Silicon Valley start ups have been founded by Indian- Americans. 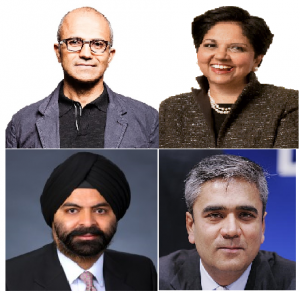 Nadella who recently became the CEO of Microsoft joins a select circle of other Indian leaders of major global corporations, including Indra Nooyi, chairman and chief executive officer of PepsiCo, Ajay Banga, the chief of MasterCard and Anshu Jain, the co-CEO of Deutsche Bank . Other Indian CEOs of major U.S. companies include Francisco D’Souza of Cognizant Technology Solutions, Sanjay Mehrotra of SanDisk, Ravichandra Saligram of OfficeMax, Dinesh C. Paliwal of Harman International Industries and Shantanu Narayen of Adobe Systems. In my opinion, the significance of the contribution of Indian-Americans has played a central aspect of identity in terms of growth of the American economy. In years to come, the demographics would increase radically making both the nations share an unprecedented bonhomie.